In Napa Valley there's a term, "lucky sperm," for somebody who inherits a great vineyard or winery. What does that make Michael Thomas? He didn't quite inherit: he took over a Monterey County winery, Wrath, and San Saba Vineyard when his 82-year-old stepfather didn't want to run it anymore. He didn't like the wines; his stepfather ill-advisedly planted too much Cabernet. He likes the terroir, but his stepfather also short-sightedly prevented the estate vineyard from being part of a more prestigious appellation. "We've got 20 feet of asphalt separating us from Santa Lucia Highlands," Thomas said. "The reason we're not in (the appellation) is because my stepfather managed to piss everybody off." Thomas, 43, took over in 2007, just as the market for $40 wines went south. He lives in New York and works at University of Texas as a teacher and in Italy as an archeologist, so Monterey is a little out of the way. But he did get a winery and vineyard. So is he lucky? "It pretty much killed my archeology career," Thomas said, though he's still working on an Etruscan estate northeast of Florence that he's been excavating for 15 years. Thomas, who looks like Jason Giambi, has taken on a big task for a guy who's not here often. He's trying to mend fences with his neighbors. With the help of Byron Kosuge, he's trying to make better wine. And he's trying to find a market in a year when full-time farmers are also working the phones, looking for a home for their grapes. "We were selling fruit for $2800 a ton. This year we'll be lucky to get $1200 a ton," Thomas said. "We were selling fruit until this year. This year we made bulk wine because we couldn't sell the grapes. I've got some beautiful Chardonnay in bulk right now and I hope I'm going to be able to sell it." He's also lobbying his wife to move to Monterey, but "my wife is pushing to move to Texas." I'll be brutally frank: I don't see how he's going to make it. And the shame about that is that as an archeologist -- somebody who thinks a lot about different layers of soil -- and an Italian wine drinker, he's the right guy to understand his estate vineyard and wring the most potential from it. And he uses some interesting names. A "destruction level" is a black carbon layer that was a settlement. "It has a smokey quality to it," he says. The Wrath "Destruction Level" Monterey Sauvignon Blanc 2008 ($29; Gray Market Report 89 points) has a full, round mouthfeel, but is not too big and is just 13.2% alcohol. I like the exotic pineapple, lemon grass and escarole flavors. This wine has seen 30% new oak and gets some of its richness from the unusual inclusion of 3% Chardonnay. It's all estate fruit, but Thomas (foolishly?) doesn't say that on the label. The reason? It's a contrast to the unadorned version of essentially the same wine, the Wrath San Saba Vineyard Monterey Sauvignon Blanc 2008 ($23; Gray Market Report 90 points). Made in 100% stainless steel, this wine also has the same pineapple skin, lemon grass and escarole character, but with a leaner mouthfeel and slightly lower alcohol (12.7%). Call me a purist or a cheapskate, but I preferred this version. "Fermata" means stop. 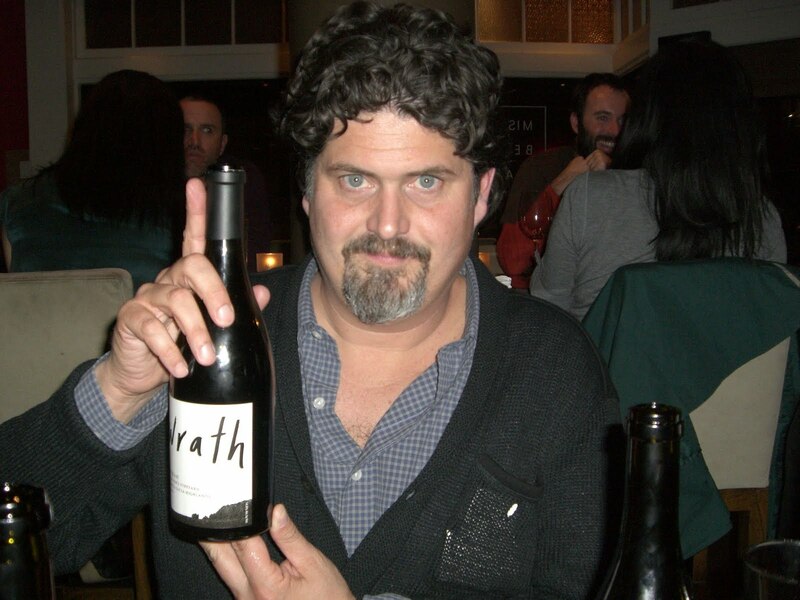 Wrath "Fermata" Monterey Chardonnay 2008 ($40; Gray Market Report 89 points) gets the name because he stopped malolactic fermentation, leaving the wine toasty, lemon and intense, but not woody. It's rich but still keeps its acidity; this is what good Santa Lucia Highlands Chardonnay tastes like -- even though it's from across the street. "A lot of our Chardonnay is on own-rooted 30-year-old vines," Thomas said. I also liked his Wrath Doctor's Vineyard Santa Lucia Highlands Syrah 2007 ($50; Gray Market Report 90 points) from purchased fruit; it's very savory and Rhonish, with notes of smoked beef, pepper, black plum, raspberry and earth. He made only 70 cases, a good thing at a bad time for $50 Syrahs. Thomas is a realist about his chances. "Australia is selling Chardonnay at pennies on the dollar," he said. "That affects the whole industry worldwide. I think Northern California will be the last place to recover." At least he has two good day jobs. And as the Duke graduate says, "my sports teams are the most hated teams in sports -- the Cowboys, the Yankees, Duke basketball." So I guess he's the luckiest man on the face of the Earth. Picked up Wrath in Napa JV Wine & Spirits last Friday as I walked out. The Farmer commented, "That should be YOUR label." Mending fences with neighbors, getting creative with marketing, and bringing an outside prospective to the wine industry will serve some well. It will also serve the industry in its entirety well. Some of the most noteworthy winemakers, marketers and growers on the scene at the moment are from "outside" this industry. I agree with Thomas and his read on the Chardonnay market. I kindly back your comments as well about not seeing how he's gonna make it. It's the worst grape market, being undercut by the wine market ever according to The Farmer. Today a wine & grape broker agreed with us on that point, but said no amount of ingenuity would get us out of it. Only time.